EXPLORE ELLISON’S TAKE ON THE SCIENCE FICTION WESTERN: Cutter’s World, Ellison’s two-hour 1987 pilot for a Western-tinged science fiction series for CBS (fifteen years before Joss Whedon finally got one on the air with Firefly), tells the story of guilt-ridden 20th century astronaut Ben Cutter’s journey to an alien world, where he and his twelve-year-old son, Mac, must carve out a life for themselves in the perpetual twilight of a world inhabited by two species in conflict: the humanoid vivo, and the kyben (the recurring beings featured in Ellison’s Night and the Enemy story cycle). Ellison began work on “The Queer File,” a short story about a man paid to catalogue strange occurrences, while he was living in New York City in the early 1960s. By early 1964, the story had become a novel titled OBITUARY FOR AN INSTANT. Then, just as Ellison started chapter four, The Outer Limits came calling and the novel’s premise evolved into “Demon With a Glass Hand,” the teleplay for which appeared in BRAIN MOVIES, Volume One (which is still available in both the signed and standard editions). 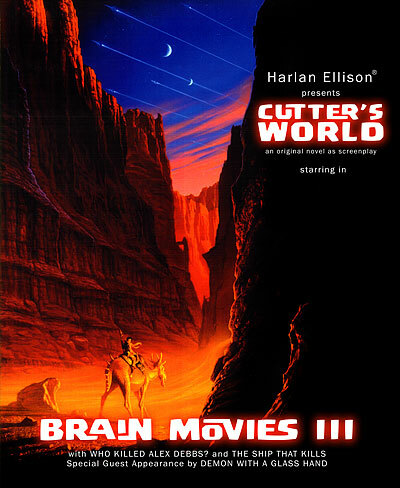 With the publication of BRAIN MOVIES, Volume Three, every step in the award-winning tale’s evolution—including the initial outline where the protagonist was involved in a cross-country chase rather than the vertical pursuit through LA’s historic Bradbury Building, as seen on ABC—is unveiled to chronicle the author’s creative process. READ THE SCRIPT THAT SECURED ELLISON’S TELEVISION CAREER: “Who Killed Alex Debbs?” is the first of Ellison’s four teleplays for the 1960s crime series Burke’s Law and features the titular LAPD Homicide Captain investigating the murder of a Hugh Hefner-inspired publisher. Read the script that landed Ellison his first ongoing gig in Hollywood and led to the hot up-and-comer being listed as one of Cosmpolitan’s six most eligible bachelors. PUT YOURSELF IN THE STORY EDITOR’S CHAIR AND PREPARE TO EXPERIENCE AN ELLISON PITCH: “The Ship That Kills” is a “lost episode” of the 1974 series The Manhunter, starring Ken Howard. For years, Ellison wondered why his segment of the depression-era action series never went before the cameras. Now, you can read his storyline—written with the same energy with which he verbally pitched it to the story editor—and discover, in the editor’s notes, the reason that the episode was never made. Cover art by 15-time Hugo Award winner and Science Fiction Hall of Fame inductee Michael Whelan.